Other special areas in the wood include the Gorses and Linden Glade. Scroll down to find more about these and other features of the wood such as our much photographed carved bear. In 1977 the Croydon Girl Guide Association sponsored the purchase of 400 oaks and beeches to be planted in commemoration of the Queen’s Silver Jubilee. The area was to be called ‘Jubilee Plantation’. Plans for this were announced in the minutes of the Joint Committee of Management of the Selsdon Wood Nature Reserve by the Chief Officer of the Parks Dept in his annual report concerning Selsdon Wood (dated 20 Dec 1977). 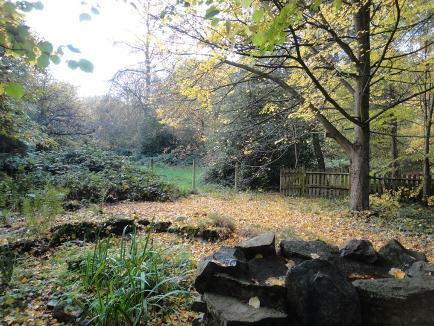 Over the next 35 years this area became rather neglected and so the Friends of Selsdon Wood agreed to work with the Council’s Community Partnership Officer and Forestry Adviser to implement the Management & Action Plan for the plantation. The Friends found that the original planting had been overwhelmed by large trees like sycamore. The ground was littered with dead trees and branches. Smaller shrubs like elder and holly could not survive to give cover and food for birds. This situation was addressed in 2010/2011 A number of the large trees were removed and the Friends, with Council support, planted 260 trees and bushed comprising: wild service, field maple, elder, silver birch, hazel, wild cherry, spindle, guelder rose, blackthorn, and dogwood. The Friends are now trying to keep these free from the potentially overwhelming growth of Old Man's Beard and other unwanted plants. Sections of the rest of the plot will be coppiced and pollarded to establish a bird friendly bushy understorey. The new stock fence, erected by the Council in 2011, is giving some protection to the new growth - see the photograph taken in 2011. In 2012 the FSW were approached by a representative of the Brownies/Guides, who said that they again had some trees to plant - this time to commemorate the Queen's Diamond Jubilee. Sixty trees were provided, one for each of Her Majesty's 60-year reign and space was found for them in the Jubilee Plantation. The original date for planting (February 11th 2012) had to be cancelled as the ground was covered with snow but the event was rearranged for Saturday 3rd March and the FSW spent a number of days working on the preparation of the plot - see right. Four sections were mapped out in the southwestern corner of the plantation and 15 holes were dug in each section, and marked with a stake labelled with the name of the tree to be planted there. On a sunny Saturday afternoon, two dozen Rainbows (aged 5-7), Brownies (aged 7-11) and Guides (aged 10-14) met a number of Friends at 2pm in the car park. The girls came equipped with their own trowels, spades and gloves and were accompanied by Jo Wheeler, coordinator for the Brownies and Rainbows, and several supportive parents. 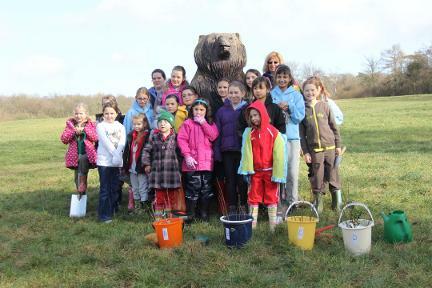 After a group photograph in front of the Selsdon Wood Bear - see below left - David Malins introduced the project and allocated the young trees (whips), which had been pre-sorted into four buckets, one for each of the four groups of girls. The girls carried their buckets and spades up the hill to the site and after a short instruction (including a warning on staying safe), set to with great enthusiasm to plant the whips in the prepared holes. They watered each planting (the Friends had brought plenty of water) and then stood back to admire their work. The whole task was completed in less than an hour and was rounded off with another photograph - this time in front of the gate with its name board saying ‘Jubilee Plantation’ - above right. Each of the girls was given a certificate marking the event and all took away a copy of the FSW leaflet and map. Many of the older girls readily spotted the position of the Jubilee Plantation in the map (labelled Jub) and all promised to return in coming years to watch the progress of their saplings. Hannah B (Rainbow, aged 5): I liked planting the trees so we can see them grow big and because it's the Queens Jubilee. Hannah T (Rainbow, aged 5): We planted cherry trees and birch trees for the Queen. I will come back to see how they grow. Felicity (Brownie, aged 7): The Brownies went to Selsdon Woods. Very nice people work in Selsdon Woods. We planted cherry trees. The wood is important because if we took the trees away, there would just be bare land and the wildlife would go forever! We need to plant trees because people are cutting down trees and trees give us clean air. Anna (Brownie, aged 7): When I planted trees I planted a holly tree. I also planted a birch tree. Hannah W (Brownie, aged 8): In tree planting I planted 2 spiky hollies, a rowan and finally a wide rose. Together we planted 60 trees in the Jubilee Plantation in Selsdon Woods. It was fun! Rebecca (Brownie, aged 9): We planted all our birch, hazel and rowan trees in Selsdon Woods. The Jubilee Plantation was divided into 4 sections for us. There were already holes for the baby trees but we had to make sure they were the right size and water the trees when we had planted them. 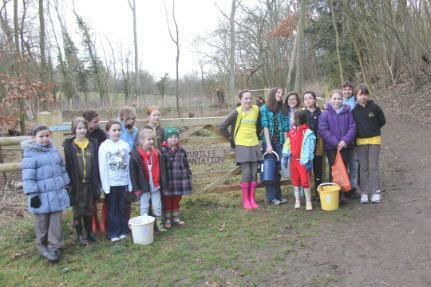 Lucy (Guide, aged 12): Rainbows, Brownies and Guides went to Selsdon Woods to plant 60 trees between us. It was a very enjoyable experience. Friends of Selsdon Wood were very nice and showed us a secret pond. I'd tell you where it is, but ... it's kind of a ... secret. We can't wait to go back soon to see how our trees are growing. The photograph shows two of the girls planting the last whip. The Jubilee Plantation contains a concrete pond presumably installed when the plantation was created in 1977. This fell into disrepair - see the photograph to the right, taken in 1986 - but at some stage was relined and now does contain water all year round. 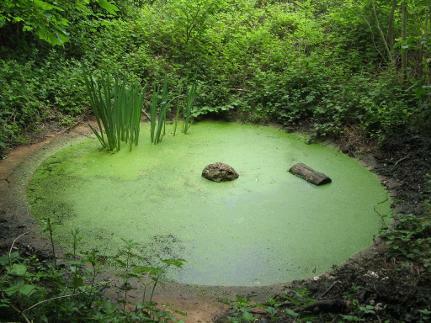 However there is much detritus in the pond which means that the water is poorly oxygenated and cannot support life such as tadpoles or fishes. 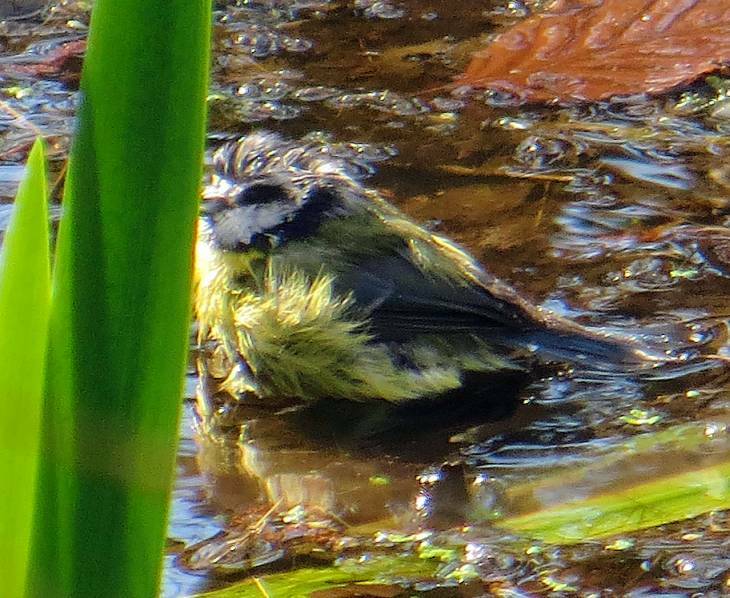 The cleaner periphery does however provide a drinking (and bathing) place for birds and woodland animals and the rotting vegetation is an ideal breeding place for water lice and many hoverflies and other insects. The Centenary Plantation was created in 1983 to commemorate the centenary of Croydon Council. 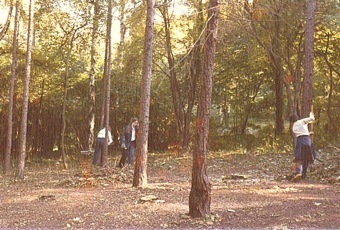 One hundred English Oaks and Birch trees were planted with the intention that the Birch would be felled when the Oak had matured - see photograph below left taken in 1986. The scheme was originated by Croydon Councillor, Dudley Mead and was paid for by public subscription by Selsdon residents. In Selsdon library there is a book containing the names of all who subscribed (£5 per tree - quite a lot in 1983). Four of the trees along the edge of the field can be seen to be larger than the others. These were planted as heavy standards and were about 10 years old at the time of planting. The others were much younger whips that took quite some time to become established. There was a planting ceremony attended by the then Mayor, Councillor Peggy Campbell, and the member of Parliament for Croydon South, the Rt Hon Sir William Clark (both now deceased). 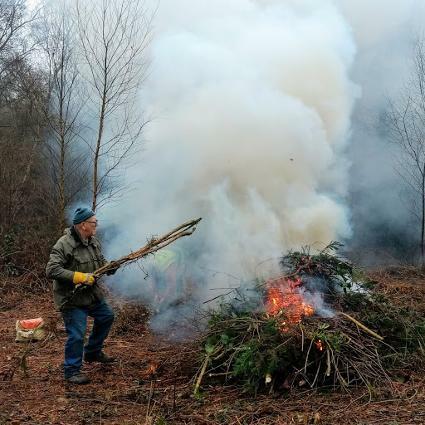 This area was subject to a Council Management & Action Plan to be implemented by the Friends of Selsdon Wood in partnership with the Council’s Community Partnership Officer and Forestry Adviser. Early in 2009 the Friends embarked on a systematic clearance of the seedlings, saplings and plant growth that were overwhelming the original oaks of the Centenary Plantation. They also removed dead and distorted growth from the oaks in an attempt to restore the original stand. 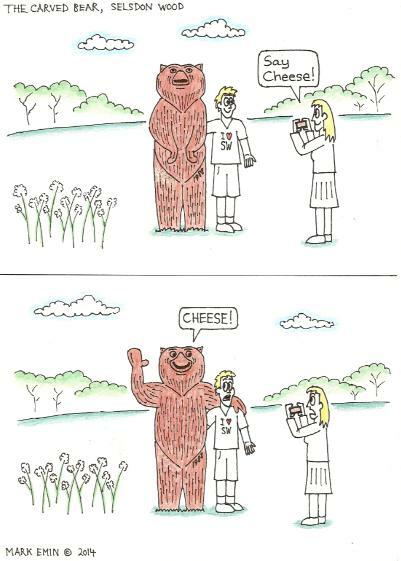 It is a pity that squirrels cause so much damage to trees. The cuttings were used to form a dry hedge to give some protection to the plantation. A surprise bonus was the emergence of a large number of white helleborines and a solitary clump of broad-leaved helleborines. These are relatives of the orchid family. There is more work to be done but we hope you agree that the appearance of the plantation is now more attractive - a big improvement on the uncontrolled thicket it had become - see the photograph below right taken in May 2012. 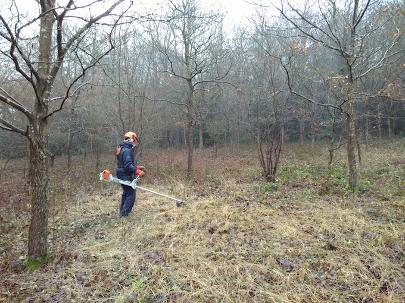 Our thanks to Peter Underwood, Senior Project Officer for The Conservation Volunteers, who, with a colleague, spent a wet miserable day brush cutting the Ash seedlings and bramble in the Centenary Plantation (see photo to the right). The FSW wish to see this area kept as an Oak plantation as originally designed but we do not have the resources to undertake the removal of the thousands of Ash seedlings which threaten to swamp the Oaks so we are especially grateful to TCV for their help with this. A wooden plaque can be seen on a pine tree buried in a plantation on the left of Greenhill Way, just after entering the wood from Green Hill. Mrs Chris Alexander, a local resident, informed the Friends that the wooden plaque was linked to her husband, Gordon Alexander. In the late 70s, early 80s he was responsible for running a Youth Opportunities Scheme in Selsdon Wood while employed in the Croydon Council Parks department. He has since retired. 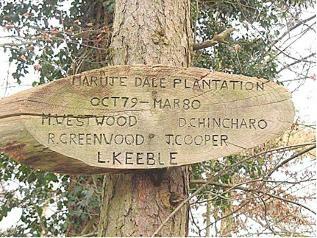 The name of the plantation was made up from the names of the young people who took part. During their training they covered coppicing and maintenance work and they were taught how to make benches and bird boxes with the wood. New trees were also planted - mainly beech. Gordon Alexander has provided us with some photographs from the time. In 2011 many of the benches are still in use but the legs and joints of some show advanced signs of rot. A few have been renovated by the Friends by cutting down old guide posts. Photographs show work underway in 1970/80 and the Maruje Dale plaque. Gorse has acquired many names from different parts of the country - Furze, Gorst, Fuzz, Vuzz and Whin. Also - Fingers and Thumbs, French Fuzz, Furra, Hawth, Hoth, Honey-bottle, Ling, and Pins and Needles. We have been puzzling over the reason for the hundreds of Gorse plants that sprang up when the Larch plantation was felled. We know from an 1800 map that the area bounded by East Gorse, West Gorse and Farleigh Border used to be called Broad Field and may have been used for arable crops. Then the 1898 Ordnance Survey shows that the plot was covered in scrub. The same 1898 map shows chalk pits and Limekiln Shaw in nearby Farley (Farleigh). Before the coal trade developed, Gorse was of great value – a fuel for bakers, brickmakers, lime-burners and farmer’s wives. Many farms had their ‘vuzz’ break. The Vuzz was cut and faggoted and used to fire bread ovens. In addition, crushing the spines made it suitable for winter feed for stock. Itis possible that the Gorse in Selsdon Wood was grown to fire limekilns. The extract from the map for the 1924 Conveyance from W. Noakes to A E Cresswell, shows the area as scrub and coniferous trees and labelled 'The Gorse'. Subsequently the area was planted with trees including Larch and much of the Gorse disappeared. 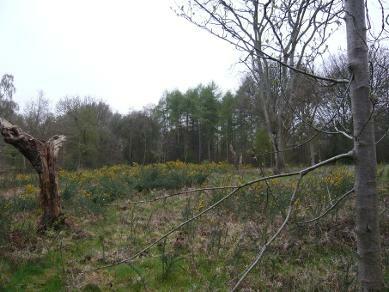 The main Larch plot was felled in 2009 and the Gorse has returned. A Friend of Kelsey Park brought much of the above information to our attention from Geoffrey Grigson’s ‘An Englishman’s Flora’. When thou from hence away art past, Every nighte and alle, To Whinny-muir thou com'st at last; And Christ receive thy saule. If ever thou gavest hosen and shoon, Every nighte and alle, Sit thee down and put them on; And Christ receive thy saule. By 2016 the Gorses area hd become very overgrown since the larch plot on the site was felled in 2009. Although the new growth of gorse looked spectacular for the first few years it had become very tall and leggy and tangled with brambles. In the 2016/2017 winter season the Friends undertook the job of cutting everything back right to the ground in the sure knowledge that it would quickly recover. Naturally occurring gorse is adapted to frequent burning. The upper parts burn freely and the seeds germinate most readily after fire but the roots are very resistant to burning and shoots readily return. It could be dangerous to freely burn our gorse as fire could spread to the rest of the wood so we had to take the harder route and cut it back by hand. We were assisted by TCV (The Conservation Volunteers) working under the supervision of Peter Underwood (Senior Project Officer - Croydon & Surrey). They put in a couple of days’ work at the end of November 2016 and made a big impact, including cutting an avenue through from Middle to East Gorse and returned for a further day in January to clear more of the plot. The FSW work continued through to March. The photograph shows Ted loading the bonfire. Linden Glade gains its name from the 5 Lime trees planted in a semicircle around the edge of the glade - probably around 1980. The Lime (known in earlier times as Linden) was part of the ancient Wild Wood and Limes were coppiced up to the Middle Ages to provide timber for building, furniture, carving, firewood and rope-making. Monks kept their hives beneath the trees for the rich pale honey and the flowers were used to produce herbal medicines and tea. In more modern times the wood has been used for guitars and wind instruments. When explorers brought back hemp for ropemaking the tree fell into decline, being replaced by the more productive hazel which abounds in Selsdon Wood today. One of our Limes has been pollarded in a gale and the resulting long stems must be typical of what was used for rope making. .
Linden Glade houses the Memorial Bird Pool presented by Col. H.S. Wood, I.M.S.and Mrs Wood, of Kensington at the time of the opening of the wood as a public Nature Reserve in 1930. (See the History page for details.) 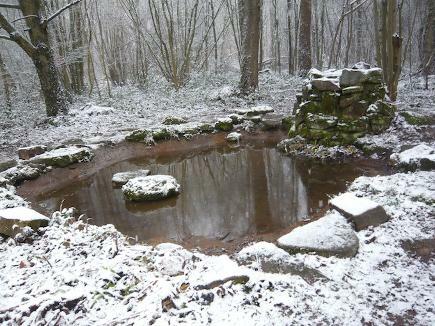 There was a water supply to the bird pool but this was cut off some years ago as it was too expensive to maintain. The pond filled with mud and fell into disrepair but was restored by a project undertaken by FSW in 2016. See the Projects page for details. The light of the sapphire skies, Peace of the silent hills. Photographs show Linden Glade in February 2017 and Autumn 2011.